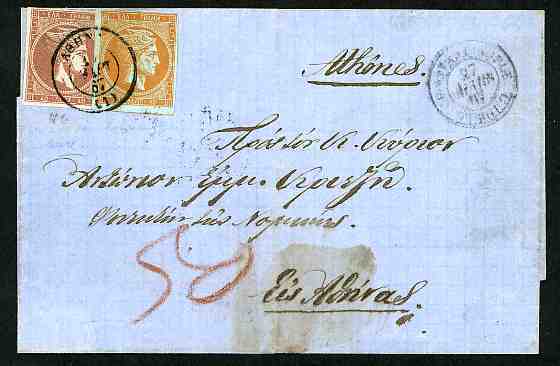 FRANCE BUREAU DU LEVANT CONSTANTINOPLE: Greece second Athens print 40 Lepta rose-mauve on lilac and same issue 10 L. orange on blue both with wide margins, cancelled "ATHENS 17 MARCH 67" used as postage dues on 1867 lettersheet from the French PO in Turkey "CONSTANTINOPLE 27 MARS 67". Very fine condition. 50 Lepta rate = 30 Lepta French ship + 20 Lepta Greek domestic postage.